Kale is a green to be thankful for. Its high-fiber, nutrient-dense, low-calorie nutrition profile helps you detox, lose weight and keep your immune system strong through the cold winter months. 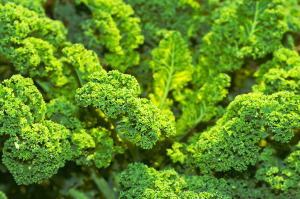 Kale is also high in anti-oxidants and anti-inflammatories, which helps to fight cancer and other dangerous diseases. 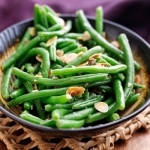 This 5 minute side dish compliments any entrée with its stimulating flavors. It also adds a happy green reminder to your winter plate of warmer spring days to come. Fill the bottom of a steamer with filtered water and bring to a boil. Place the kale and onions into the steamer basket and place over the boiling water. Cover and steam for no more than 5 minutes. While the kale is steaming, combine the olive oil, lemon juice, pressed garlic, salt, black pepper and chili flakes in a large bowl. Transfer the hot kale and onions into the bowl with the dressing and toss to coat with clean hands, massaging the dressing into the softened greens. Serve while still warm. ***Reserve the nutritious steaming water that you are left with after cooking the kale. 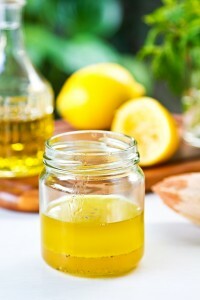 Store it in the fridge and add it to soup broths or home-made juices and smoothies. Need the whole vegan meal? Try pairing this with our Vegan Lentil Soup!